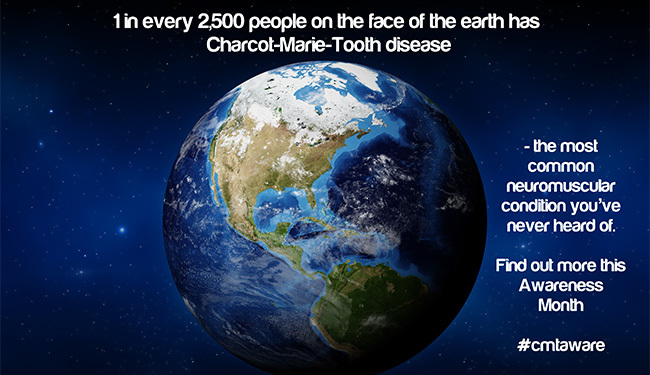 CMT Awareness Month is being launched by charity Charcot-Marie-Tooth UK on September 2018. TalarMade would like to help raise awareness of this condition and CMT UK is calling for more orthotists to be aware of the condition and help those with it get the help and diagnosis they need. How would you feel if you were told you had an incurable condition, that you were going to lose the strength and feeling in your hands and feet and that you might end up in with severe mobility problems? Orthotists should look out for patients presenting with corns, callouses or hard skin on their feet, which comes about when people have to walk on a different part of their foot due to muscle wastage in the legs. There could also be a change of shape in the foot such as a high arch or flat foot and hammer or claw toes. Patients may also mention other classic signs of CMT such as clumsiness, pain, balance problems leading to unsteadiness, trips and falls and chronic fatigue. These signs don’t necessarily mean the patient has CMT, but it is a good indication and if CMT is suspected, then they should be told to visit their GP who can refer them to a neurologist who is able to undertake a full assessment, including nerve conduction tests, to make a diagnosis. While CMT is currently incurable, early, accurate diagnosis can improve the lives of those with the condition as it can be managed more effectively, and proper genetic counselling can be received so the risks to the next generation can be learned. For all you need to know about Charcot-Marie-Tooth disease, and how you can help us find a cure for CMT and better support people affected by this condition, go to www.cmt.org.uk.